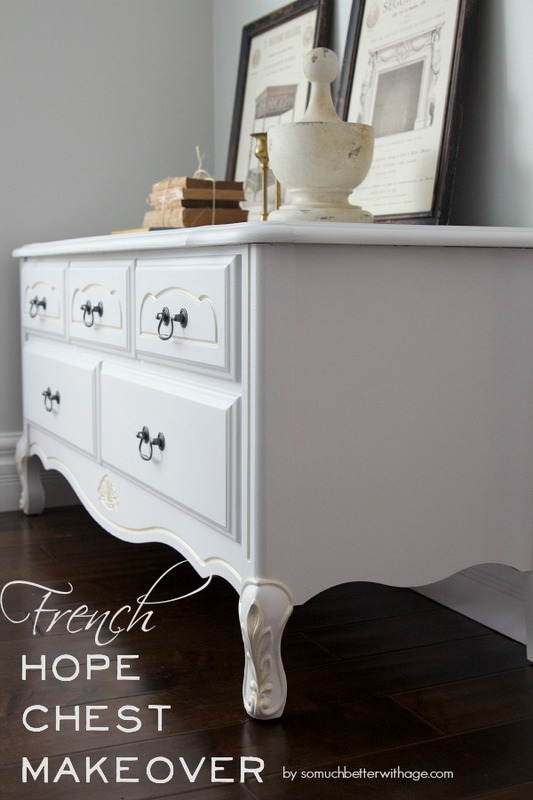 How I turned my sentimental hope chest into a French chest with a little makeover! I’ve had this hope chest forever. It was my sweet 16 birthday present from my parents. It has been with me through every move. It’s been used as a TV stand, a bench, a place to set my stereo onto, at the foot of my bed and a storage unit. But I actually did use it as an actual hope chest when I first received it and I held on to some precious items from my grandmother as well as special keepsakes. It was time, though, for a well needed makeover. 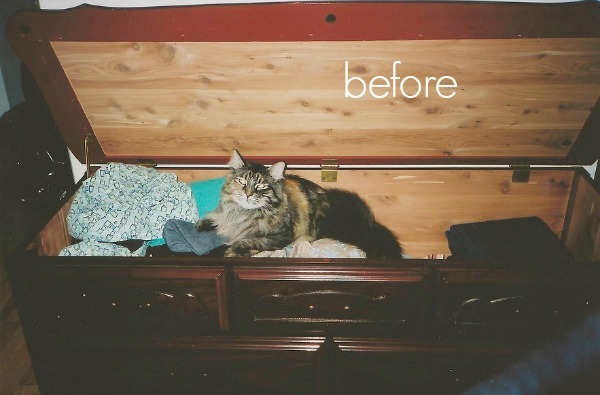 Here is the only before photo I could find of my hope chest. Please excuse the awful shot. Awww, I miss my cat, Juliette. You might have noticed this image on my Instagram feed. I had painted it years ago and added a brown glaze to it but I was never crazy about it. I tried out various Fusion Mineral Paint samples and I loved the two on the left (Casement and Lampwhite). I could not decide which one to go with. Casement was too white and Lampwhite was a touch too grey for me so I decided to mix the two together. Now it is a very, very pale grey. I tried out gilding paste for the first time and love how easy it is to apply. It comes in a tiny pot. I stirred it around and put a blob on a paper towel. Then using cotton swabs I added the gilding paste in the grooves of the design and along the feet. I used only enough to make it a faded gold look but you could add more and buff it off as you go. It’s very forgiving and easy to work with. You can see my lion wardrobe in the distance. I still can’t believe how massive that thing is! 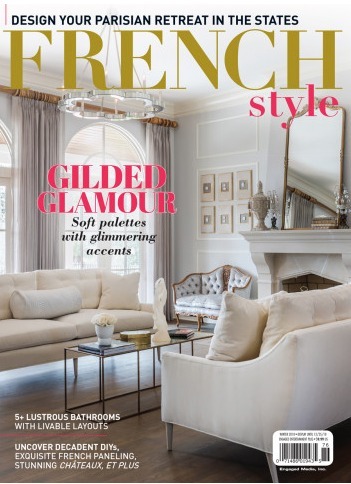 The new makeover is perfect to make it more ‘French’. 1. Visit Fusion Mineral Paint HERE and tell me what product you would love to try. 2. For a 2nd entry, follow Fusion Mineral Paint on Instagram HERE, then comment again with your Instagram name that you have done so or already do..
3. For a 3rd entry, follow So Much Better With Age on Instagram HERE, and comment again with your Instagram name that you have done so or already do. This giveaway is good worldwide. You must be over the age of 18 to win. Void where prohibited. Winner will be deemed by random draw. 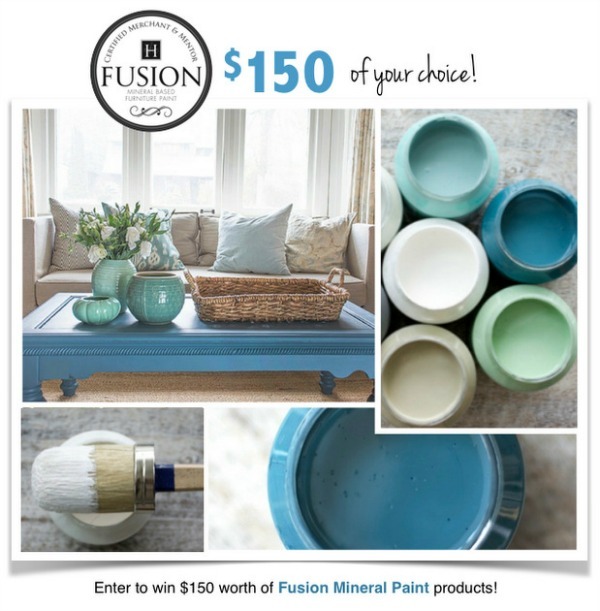 One ‘semi-finalist’ will be drawn from each of the blogs participating in this blog hop, and then the final winner of the $150 Fusion Mineral Paint will be drawn by Fusion from those semi-finalists. Winner must enter with valid email and reply within 3 days of winning email sent to you. 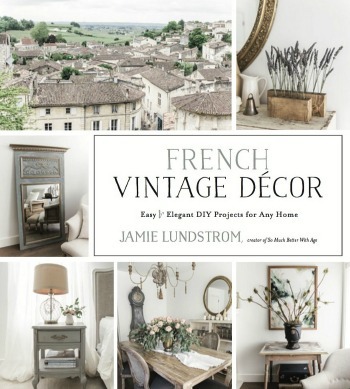 This giveaway ends Monday, May 18th, at midnight EST. Winner will be announced in this blog post by May 20th. Disclosure: Thank you, Mineral Paint, for providing me with the paint for today’s project! All opinions are 100% my own. What a great way to update something that means so much to you. And I can’t help but notice the “lion” in the background too! Beautiful!! I haven’t tried the gilding paste yet, and am looking forward to it. Very nice! What a gorgeous chest. I have an ancient armoire that’s been shelved and converted a pantry that could use a facelift. The ‘Damask’ color would look nice on it. Love the built in topcoat. I follow Fusion on instagram as rusthawk1. 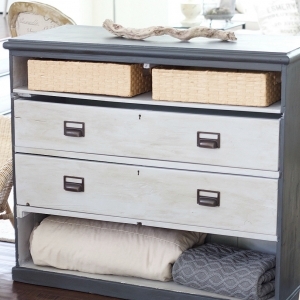 Oh I just love the hope chest!! So pretty!! I like all the colors but I think Inglenook would be nice to try. Love how you tried out the colors. What a great way to see the subtle differences. And how easy just to mix! 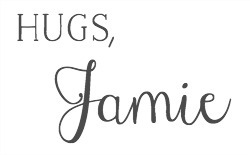 Lovely project with lots of sentiment! Looks beautiful Jamie. As always great taste and I love that you have kept this piece and updated it. The color choice is very nice and I love the gold gilding. I am now following Fusion Mineral Paint on Instagram. I would love to try the paint In Champlain. All your painted pieces are gorgeous! Thanks for the inspiration! Followed Fusion Paints on IG — angiemarie65! Already a follower on IG — angiemarie65. Wow… what a stunner! The touches of gold are amazing and perfect for this piece. 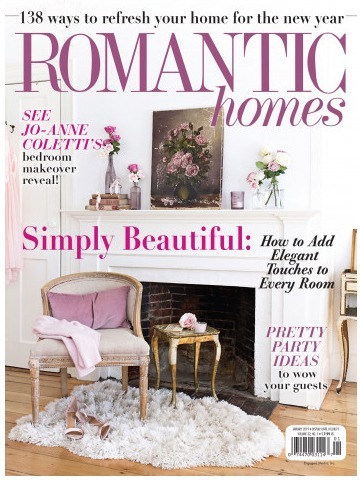 Such a beautiful compliment to everything you have in your home! Ooooh… I’m happy to see you tried the gilding paste and liked it! It’s such a lovely colour, Jamie – great job! Now tell me this: where are those handles from? Nice job your hope chest. I was given my Lane maple hope chest 55 years ago by my maternal grandmother. I would like to paint it with limestone. Lovely! 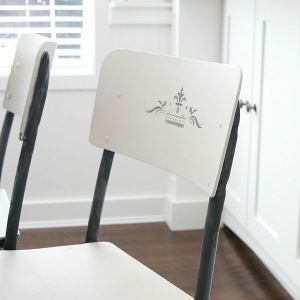 It is so nice that you’ve been able to repurpose a meaningful piece of furniture in so many different ways…..And I’m sure that there are many more years of use that it will see. 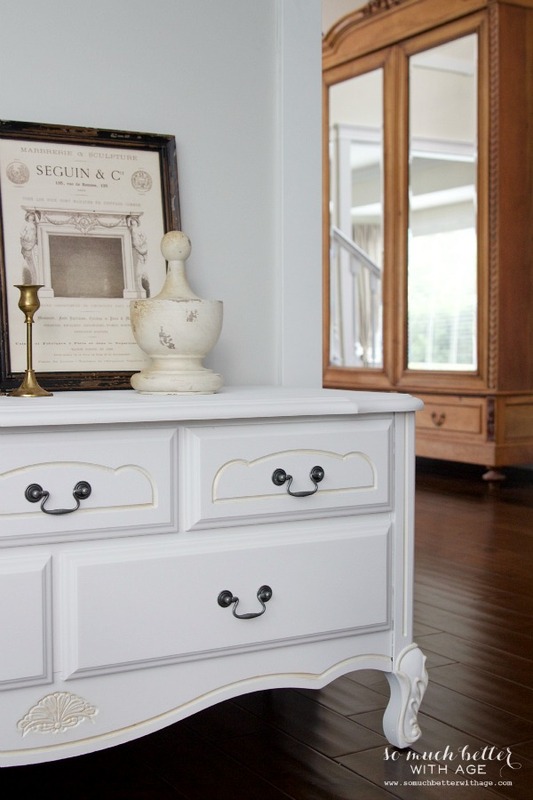 I want to try Fort York Red on an old dresser I have. That hope chest came out gorgeous! I love the 2nd color detailing! 🙂 pinned! Prairie Yellow would be fabulous on an old armoire we use as a cocktail bar in the back garden. Dreamy yellow! I like Algonquin and Lamp White. 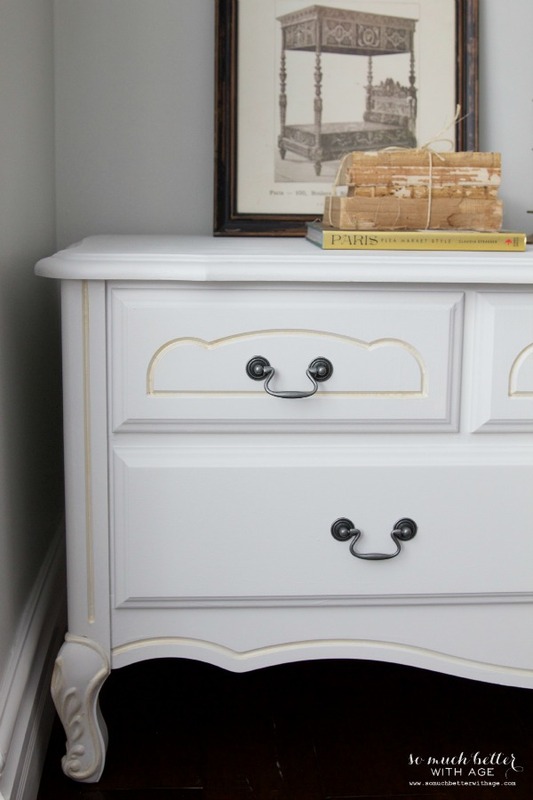 I have some chests that I need to paint and these are calling my name. 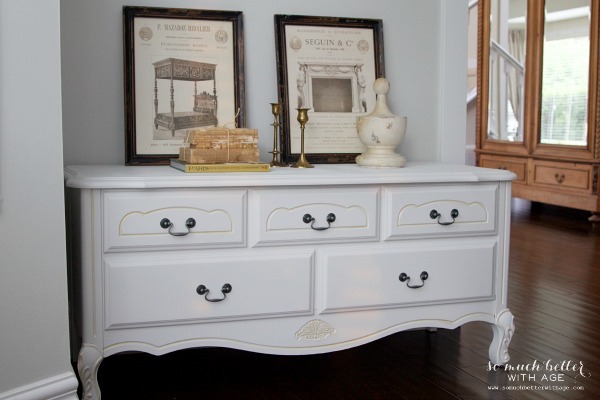 I like the way your hope chest turned out, it is stunning! I would like to try the gilding paste or the sand stone texture. I follow Fusion Mineral Paint on Instagram with the name nananurse60. I follow So Much Better With Age on Instagram with the name nananurse60. I would love to try the following Fusion Mineral Paint colours: Sterling, Champness and Renefrew Blue on a couple of end tables. My favorite Fusion color is Coal. I have an old desk that would look great in it! I follow Fusion on Instagram as msmisk. I follow betterwithage on Instagram as msmisk. I would love to try their Buttermilk Cream on a bench I have. 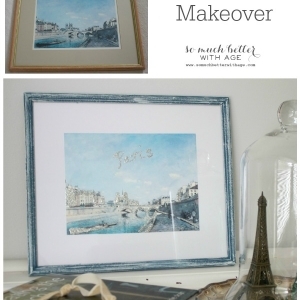 Love that make over and the two paints together make it great!! I’m following Fusion on Instagram under downsprigglane. Thanks for a chance at winning!! I’m following you on Instagram under downsprigglane. Thanks again for a chance to win!! Would love to try Fusion Mineral Paint. Tried to follow the link in #1, didn’t work. I know follow you and fusion mineral paint on Instagram. Would love to try the products.. I would love to try their embossing paste. Haven’t had a chance to do raised stencils for more than 10 years and there were no embossing pastes back then. Wow! Fusion’s colors are A.MAZ.ING!! 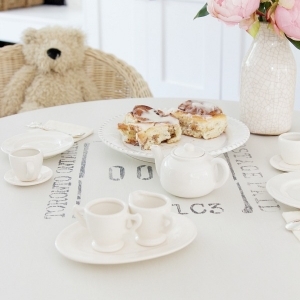 I would love to try their Upper Canada Green paint on a piece I am refinishing now! I like Casement and Upper Canada Green. What great paint! 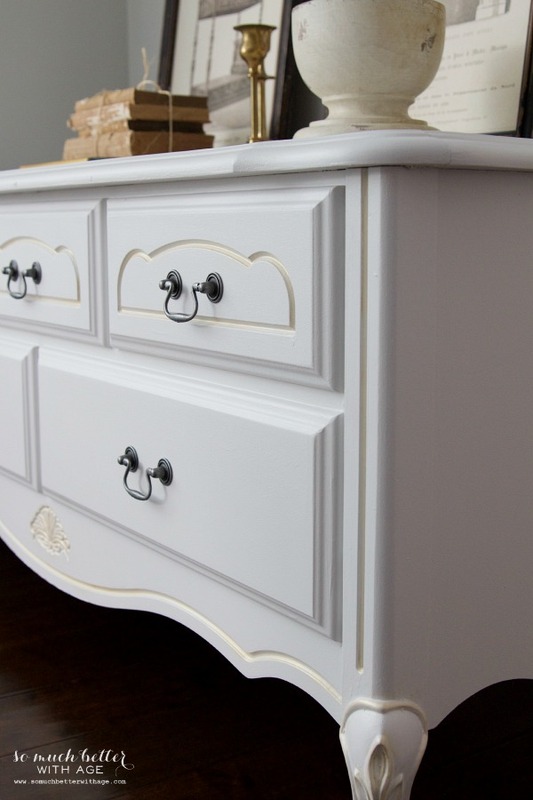 I want to paint the vanity in my bathroom. I would sure love to win. Thanks for the chance. I would love to try the transfer gel, something I have read about but never had the opportunity to try it. 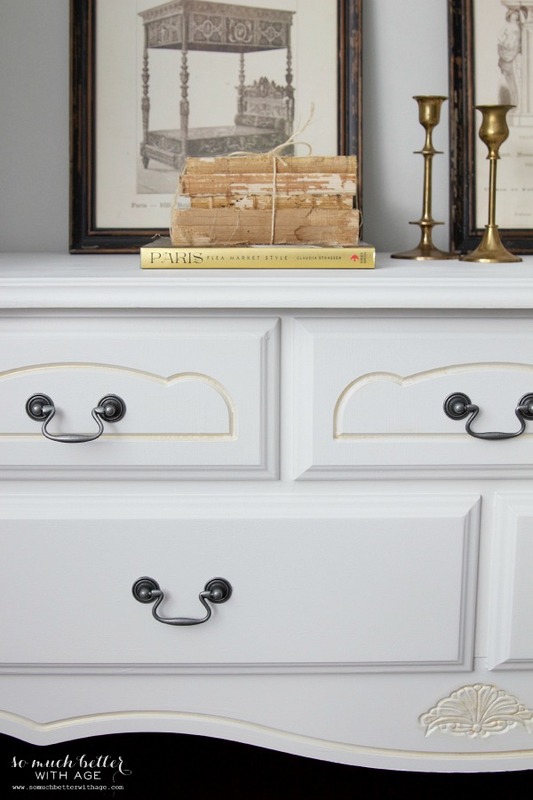 I really want to paint my kitchen cabinets with Sterling and lamp white! 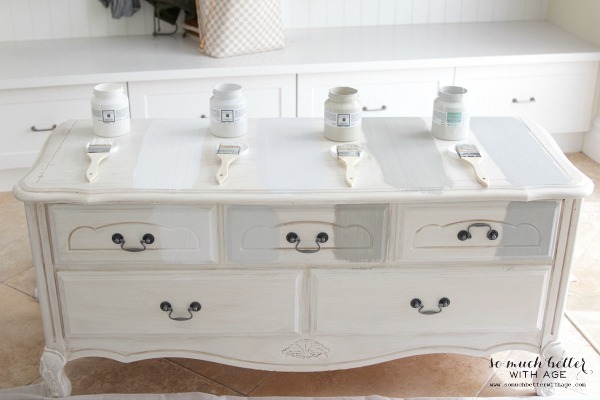 this is so awesome.i, too, have a cedar chest given to me for my 16th birthday and that was a loooong time ago (i am 77) and I’ve been wanting to paint it…you have just given me the inspiration I needed to get the job done. I have a similar piece and have been contemplating painting it for years – you just might have given me the push!! Love how your turned out! Am following both Fusion Paints and Better with Age on Instagram under ldarling. I love the Algonquin and Upper Canada paints. The colors are lovely!